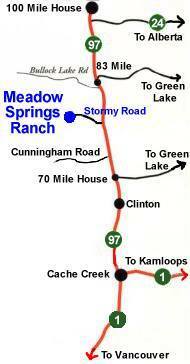 Follow Highway 97 (The Gold Rush Trail) North from Cache Creek through Clinton and 70 Mile House. Check your odometer at 70 Mile - approximately 11 km north of 70 Mile turn left on Stormy Road. 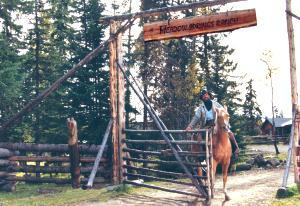 The Ranch is 3 km in on Stormy Road. It is the only place on Stormy Road which dead ends at our gate! If in doubt follow the power lines. 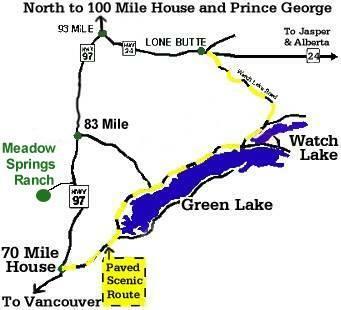 Follow Highway 97 (The Gold Rush Trail) South from 100 Mile House and past 83 Mile. Check your odometer at 83 Mile - approximately 6 km South of 83 Mile turn right on Stormy Road. The Ranch is 3 km in on Stormy Road. It is the only place on Stormy Road which dead ends at our gate! If in doubt follow the power lines. it has our phone number on it ... just in case! Below is a map of the Green Lake / Watch Lake Area showing the proximity of Meadow Springs Ranch. Green Lake is a nice swimming lake and has nice day use areas for a picnic lunch. It is also a good lake for water skiing and other water sports. Watch Lake has great Rainbow Trout fishing! Fish close to 14 pounds have been reeled in here and fishing is usually pretty good. 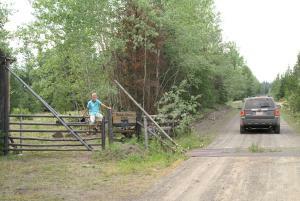 You'll come to a cattle guard with our sign (left photo) and not far past this you'll come to our main ranch yard gate (right photo) - just because it's shut doesn't mean that we're not home! Come on in, and please shut the gate behind you. Designed and built by MSR Web Site Design - web sites built for search engine results.